My early life was spent in Auckland, New Zealand, possibly one of the most beautiful coastal cities in the world. Growing up, my two sisters and I sailed and beach-combed, rode horses and swam, learned ballet and piano. My parents were keen theatre goers and as a family went to everything on in the way of concerts, opera and theatre. My sisters and I did Speech and Drama competitions and Singing competitions from the age of 7. As a student, I was an actor and director at Auckland University, and worked as an actor in the drama dept of Radio NZ. My father is a singer with one of the most extraordinary voices I have ever heard. He might have been a Heldentenor had he travelled to Europe when my sisters and I were young children. As it happened, he stayed in NZ and became a Principal Bass with the NZ National Opera Company. At 86, he still has a three octave vocal range and is an inspiration to my own work as a singer and a teacher. My mother sang around the house and was always an encouragement and support to her three daughters whenever we performed. I left NZ in 1981 for a year on the Theatre Arts (Opera) course at the Australian College of the Arts and Education. Coming home for Christmas, I attended the Cambridge Summer Music School, and was introduced to David Harper, a fellow NZer making a name for himself as a coach and repetiteur in the UK. He offered to teach me. I packed up my music and 2 suitcases, had a garage sale of everything else, and headed for the UK in April 1982. While studying with David, I worked as an agency auxiliary nurse, and busked at Covent Garden market – the first classical busker there. I sang for Peter Pears at the Britten-Pears School and worked with Morley Opera, I Commedianti, Opera Viva and Kent Opera. 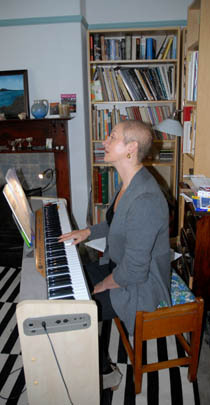 I sang in recital and oratorio around London, married, had two children and started teaching. In the late 1980s, I joined the British Voice Association and in 1999 was sent information about an Estill Voice Training System course at LIPA in Liverpool. Jo Estill was in attendance as were the vanguard licensees of the time, and I found a whole new vocabulary for my teaching. It’s fair to say that Jo Estill’s work changed my life, but it has not been the only pedagogy that has made a difference. The work of Janice Chapman, who was my teacher alongside David Harper in the early 1980s, has also been seminal, as has that of Ron Morris. The BVA has always been a beacon of inspiration for my work, being the only British and international multi-disciplinary organisation dealing with voice. The members are ENT surgeons, Speech and Language Therapists, psychologists, audiologists, voice scientists, singing teachers and voice teachers and performers working in the field, and the generosity of those involved with running and giving courses led me to read, investigate and question what I knew about singing. I was privileged to be a Director of the BVA for 5 years. I currently live in Bristol. I have two cheeky terriers and we run regularly in the green spaces around our home. I have taken up running in middle life and find that I can’t do without it. Cycling and swimming make a Sprint Triathlon a distinct possibility at some stage. I love gardens and hope to turn the ruin that is at the back of my home into a colourful haven over the next 10 years. Life is good.